I am so glad to get back to Mark’s Gospel. There is a radical immediacy in the Marcan presentation of Jesus that leaves the reader in little doubt that God is breathlessly at work in the world. There is the drama of urgency in Mark’s language and so he begins: in those days when –this and that were happening, God did this really amazing thing. What amazing thing is this? Well, we are so used to the storyline of Jesus’ baptism, which both Matthew and Luke follow, that we miss the drama of Mark’s image of God ripping apart (schizomai) an opening in the heavens. In Matthew and Luke, the heavens merely open (anoigo) like the curtain parting to reveal the opening scenes of a play – except that in both these gospels, Jesus’ baptism is not the opening scene. Only in Mark, do we first meet Jesus at his baptism. Mark presents Jesus’ baptism within the messianic transgenerational vision, here instanced by the presence of John the Baptist. However, the most dramatic aspect ofMark’s presentation is the way God rips the heavens asunder and declares in a booming voice – this is my son and I am just ripped, i.e. ecstatic about him. When something is ripped it remains tattered, leaving a gaping hole in that which was previously whole. Mark’s gospel begins and ends with images of something being ripped or torn open. Through the resulting rend a new set of possibilities flood in. Mark begins with the heavens being ripped open leaving a rend in the heaven-earth continuum that cannot be sown up again. Through this tear the Holy Spirit pours down upon Jesus, and through him deluging the world in a completely new way. 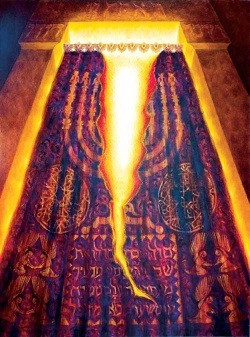 Mark ends his gospel with the veil in the Temple, separating the sacred from the profane being ripped in two. The holy is let loose from the confines of sacred space into the open space of the world. I’ve literally just returned from two weeks visiting with family and friends in New Zealand, the land of my birth. With this in mind, the contrast between Mark’s introduction of Jesus and the way Matthew and Luke introduce him is striking me very powerfully. The Jesus of Matthew and Luke is born-into his identity as God’s son. We might say his identity is a matter of birth. In Mark, Jesus’ identity as God’s son seems to be a matter not of birth, but of adoption. The coincidence of my visit home? with Mark’s Gospel being set for the Baptism of Christ has led me to reflect on my experience of the contrasting interplay between the significance of being born into, and adoption. Home – where I wonder is home? Is home birthplace or place of adoption? For each one of us, the interplay between the significance of being born-into and adoption of identity will vary. I have known a number of persons for whom this interplay is a painful one resulting from the experience of being adopted by parents other than those who gave birth to them. The experience of infant or child adoption for some can raise excruciating questions of identity because for most of us identity is primarily shaped by that which we were born-into. For others, and I count myself among this group, identity is a process of shaping within contexts of adoption. I am aware that the distinction between being born-into and adoption, even if drawn differently in each of us, is also an artificial one. Identity for each one of us is a multilayered complex comprising awareness of both the experiences of being born-into and of adoption-by. Within each of us, the boundaries between our identifications with the significances of birth and adoption continually ebb and flow. Yet, each of us will tend toward a conscious valuing of one over the other. The recent experience of traveling to the land of my birth, to my family of origin, and the friends that were part of my growing-up within that context, and Mark’s opening presentation of Jesus at his baptism is causing me to reflect anew on my experience of the interplay between the significances I attach to birth and adoption. It also leads me to pose a more general question: to what extent is our identity consciously shaped by either something we are born-into or by a process of adoption and being adopted? For the first 22 years of my life, I lived in the land of my birth. While I have no wish to underestimate the significance of the formative influences of time and place, my subsequent 37 years are years in which my adult identity has been shaped by contexts not of birth, but adoption. One result of this is that for me, family is less a matter of blood than it is a matter of choice. Most of the time, for peace of mind sake, I want to say this matter is settled. Yet after my recent visit, I am reminded that identity is never quite so neatly settled, or so it would seem. I. All of this leads me to a renewed reflection on what is given and what is chosen. This is not simply a reflection on Mark’s depiction of Jesus’ baptism and the interplay between the significances of what is given (birth) and what is chosen (adoption). I am led to a renewed realization of the significance for each Christian of our baptism as an expression of the interplay between birth and adoption, between what is given and what is chosen. II. Mark’s message is that even for Jesus, identity is a matter of choice and not simply a given of his birth. Jesus chooses to come to John and to receive the baptism of water at the hands of one who freely admits he is not worthy to untie his (Jesus’) sandals. Can we see in Mark’s depiction of the Baptism of Jesus, God choosing to use this event as the opportunity to affirm that the nature of the relationship between them is less a matter of birth than adoption? This seems a bold assertion coming so soon after the celebration of the Nativity. Yet, I do think that this is what Mark, who is deeply influenced by Paul, intends. III. If Jesus’ baptism is the moment when God tears open a rend in the heavens through which the Holy Spirit deluges the world, what then is the meaning and purpose of our own baptism? Following Augustine it has often been difficult for Christians, fearful of their place in the scheme of things, not to erroneously connect baptism with personal salvation. Yet, isn’t the gift of life, in and of itself a gift from God that is complete according to the beauty and order of Creation. All human beings by birth are made as an expression of God’s love for the world. Being loved by God is a gift we enjoy because through biological birth it is given to us. This realization leads me again and again to want to assert that: To be human is to be most like God. IV. Yet, the natural, material order is only one strand in an experience that contributes to our sense of possessing multilayered identity (ies). There is the identity as child of God through the natural processes of birth. Yet, Christians understand that there is a second birth that takes identity to a new level. This is not a material birth but a spiritual birth. The characteristic of spiritual birth is choice. We are not born into the spiritual life, we adopt and are adopted into it. Unlike our physical life, it is not a given, but a choice! V. Baptism is entry into participation in the active life of Christ. It is an entry into a set of community relationships through which we come to the spiritual life not as a journey undertaken alone, but as one undertaken in the company of one another. Together, through our baptism into the Body of Christ in the world, we become conduits for the outpouring of the Holy Spirit’s deluge of the world through the tears in a universe where before Heaven was separated from earth and the sacred walled off from the profane. Baptism is the choice to become adopted sons and daughters and God is ripped, i.e. well pleased with us! If being born human is to be most like God then being baptized is to be adopted into a new level of identity as those who know that to be human is to be most like God. Such knowledge is not only an immense responsibility, but also a humbling privilege!